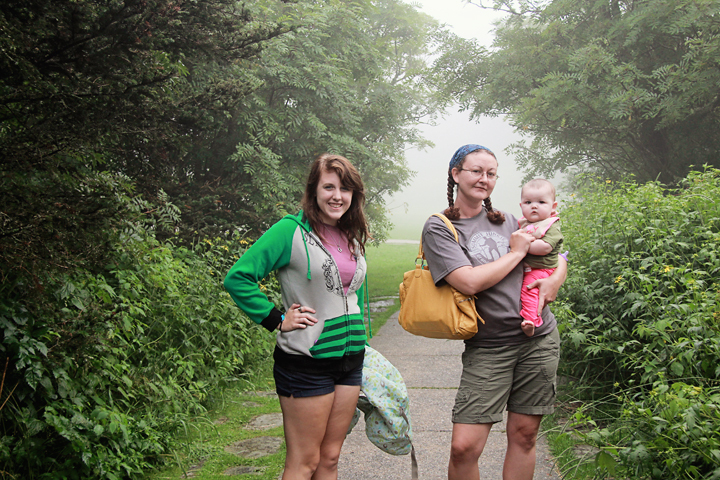 It was our second full day on our Blue Ridge Parkway trip and we (rather I) woke early once again before the girls did. For some reason, this whole trip I was always the first one up. I guess knowing that I had Robin and Ashby to contend with for the bathroom, my subconscious decided it was best to be first before anyone else was up and avoid fights over the bathroom. It wasn't long after I was done and ready, that Robin was up and at 'em. Not long after Ashby and Dinah were both up and going, we were packed up, loaded up, and ready to check out of the Hidden Valley Motel by 9am. Our first task was to sequester breakfast. It wasn't hard, as we had eyeballed a Cracker Barrel in the heart of Boone the day previous to this. It was a rather quick breakfast of biscuits and gravy and hurried because Bug had gotten quite fussy and was ready for a morning nap. So we choked down our meals as fast as we could, got our check and then after coffee to go from the closet Starbucks available. Three white chocolate mochas later and we were happily on our way through Blowing Rock and headed for Grandfather Mountain, with Dinah contently asleep. 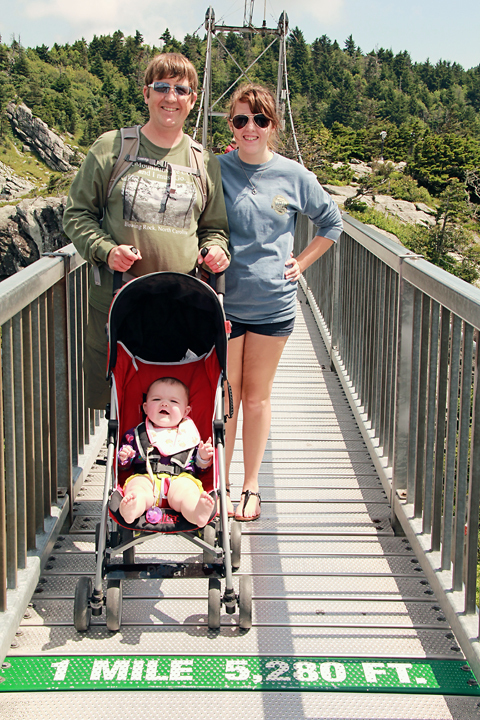 It wasn't too long before we found ourselves at the gate to enter the grounds to Grandfather Mountain. The drive up the mountain was wonderful and for the most part quite as we only passed a handful of cars coming down. We paid the entrance fee and slowly made our way to the top. We passed by Mac Rae Meadows, where people were busy taking down tents and what not. We had missed the annual Highland Games as they ended on Sunday and it was now Monday. We continued on up the mountain, driving through a picnic area, and stopping at a scenic view point where we could drink in the view of the peaks from below. After a few shots with the camera we continued the drive up to the top, passing the museum and animal habitats along the way. Just past those points of interest, the road get rather curvy and a bit steep. We were finally up top. 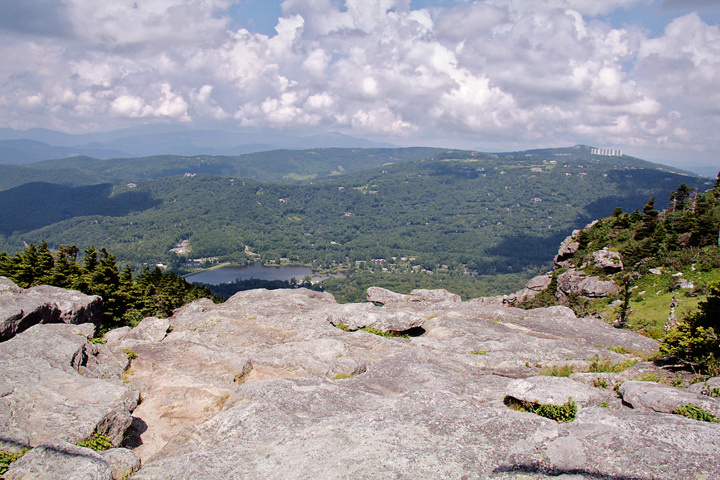 It was paradise, well except for all the people, of course Grandfather Mountain is a popular destination along the Blue Ridge Parkway. 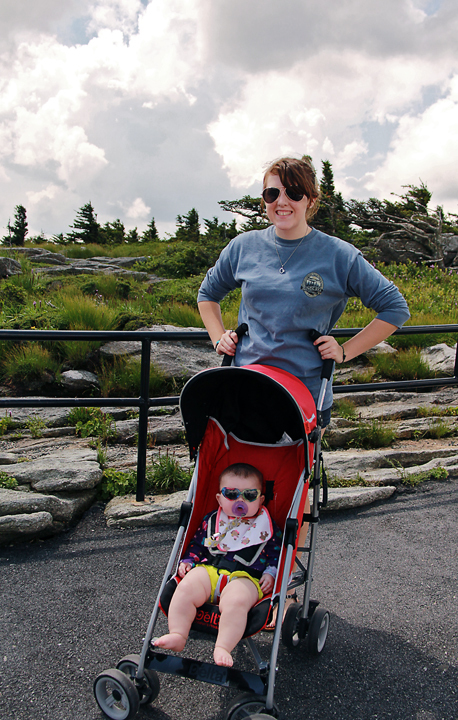 Once we were all out of the car and had Bug situated, we immediately headed for the Top Shop to play tourist and purchase some Grandfather Mountain merchandise. 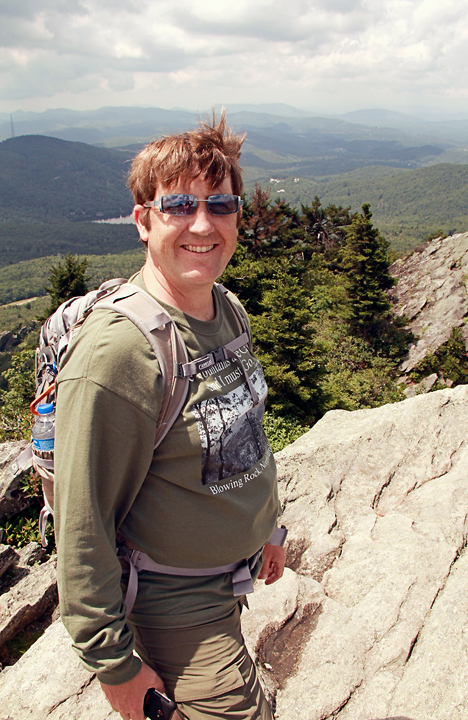 After all, what's a trip to Grandfather Mountain without purchasing some t-shirts, etc. 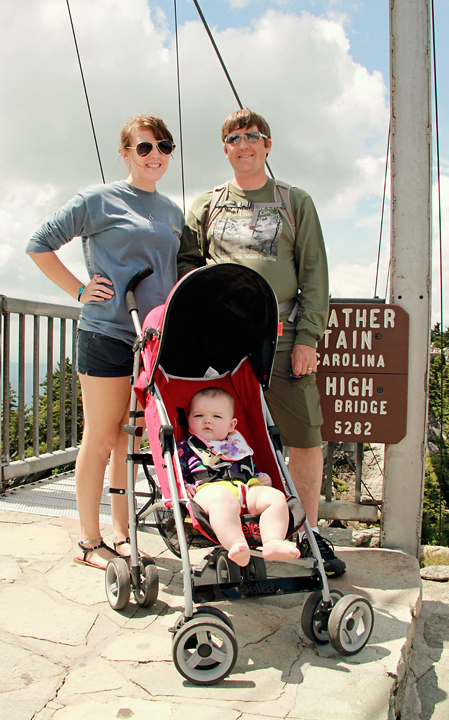 Once we finished our shopping and secured our loot back in the vehicle, it was time to go up and cross over the Mile High Swinging Bridge. Robin has tried countless times throughout her life to make it up here and nothing was going to stand in her way, not even her fear of heights or crowds of people. 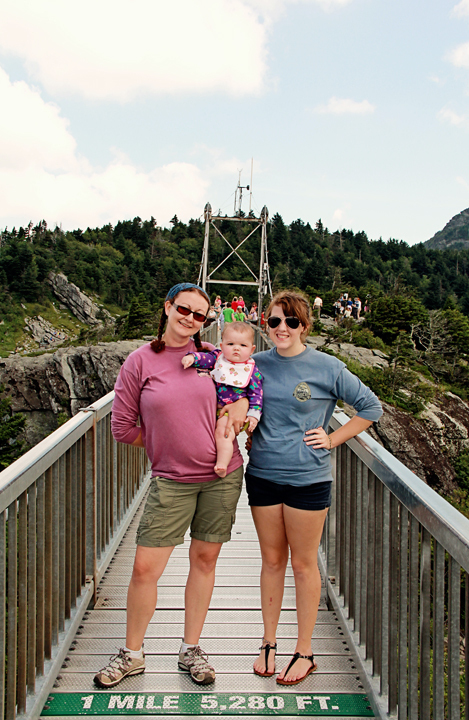 We made our way out to the bridge, stopping at the Mile High marker for a photo op, and continuing on to the Linville Peak of Grandfather Mountain. Upon crossing to the other side of the bridge, I opted to walk/scramble out to the actual peak for a better view while Robin, Kiddo, and Bug stayed at the bridge. The view out there was amazing. It wasn't long before I spotted Robin walking out towards me. 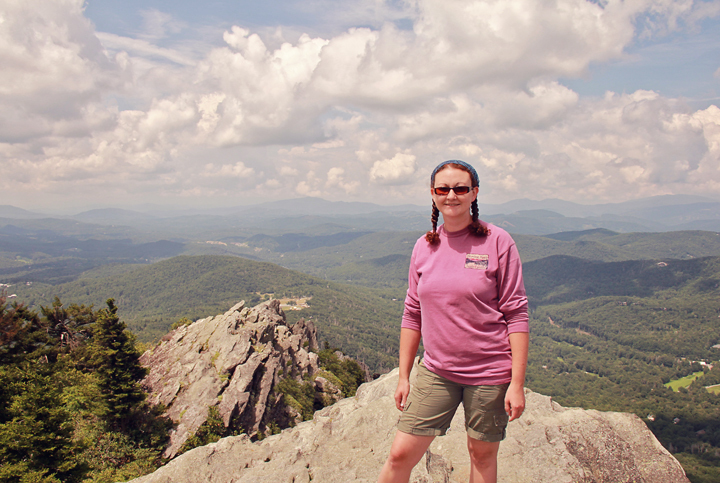 Kiddo decided she had no interest in climbing out there and was happy to stay with Bug while Robin conquered her fears and accomplished what she had set out to accomplish, standing on Linville Peak. After a few photos, we made our way back to the kids and walked ourselves back across the swinging bridge and down to the car. 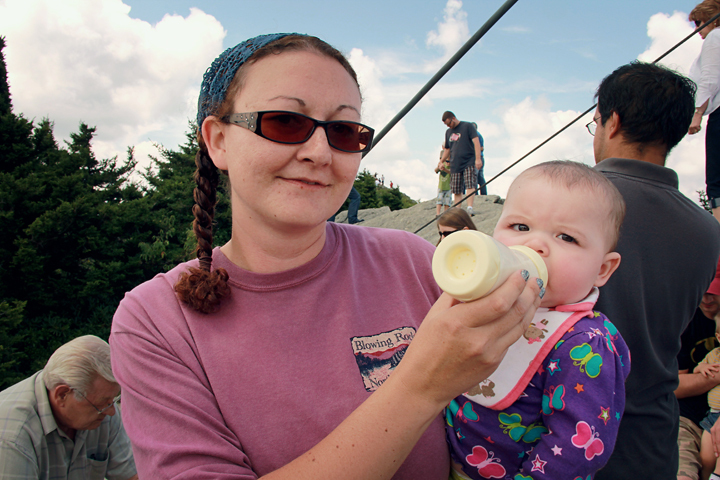 We stayed in the parking area a little bit just checking out the scenery up top and feeding Bug. Once we were ready we headed back down the mountain to the animal habitats and museum. On our way, we learned that the steep, curvy section of the road close to the top is rather famous as it has been used in various car commercials but more importantly, it was also used in one of the running scenes in Forrest Gump. I thought it was pretty cool to be driving on a section of road that Tom Hanks actually ran on. 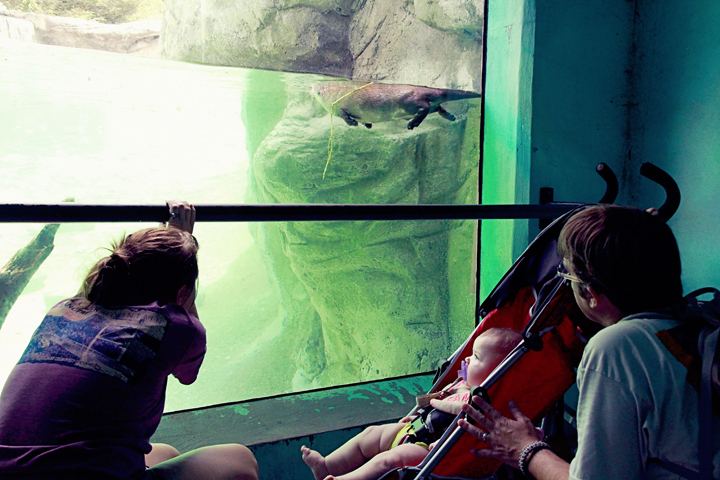 In no time we were at the habitats and museum. We all got out and loaded Bug into her stroller again and were off like kids in a candy shop again. 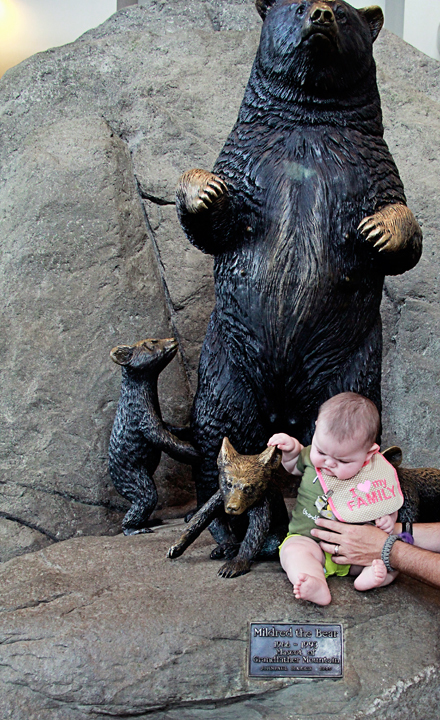 We took our time walking through the habitat checking out the river otters, the deer, and of course Mildred the Bear and her companion (although we weren't quite sure which one was Mildred). Mildred is rather famous at Grandfather mountain. 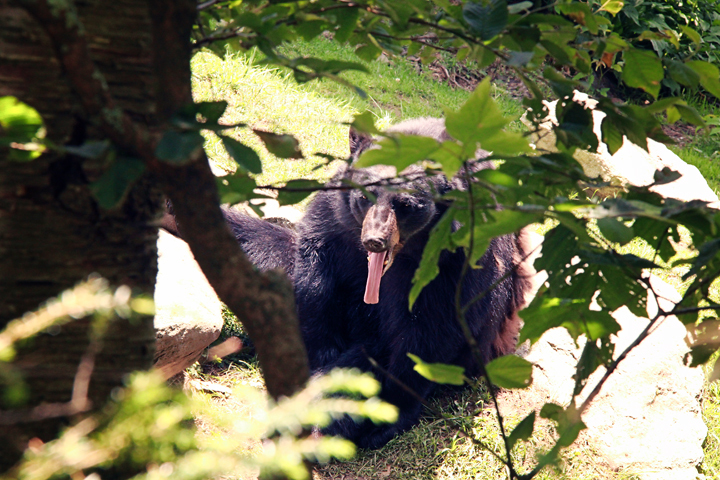 The park staff had rescued Mildred and raised her for a length of time. When it was time to release her back into the wild, she didn't go as she was rather fond of her new home and thus has been in the habitat since. Unfortunately, we didn't get to see the cougars. I guess it was to hot for them. Once we were done in the animal habitats, we headed to the fudge shop for a short break and some air conditioning. This was really the only highlight for Kiddo but unfortunately was rather disappointed to find their selection not very big in variety but rather big in price. We quickly left the fudge shop and went to the museum to check out the exhibits of birds, plants, rocks, and other historical facts about Grandfather Mountain. 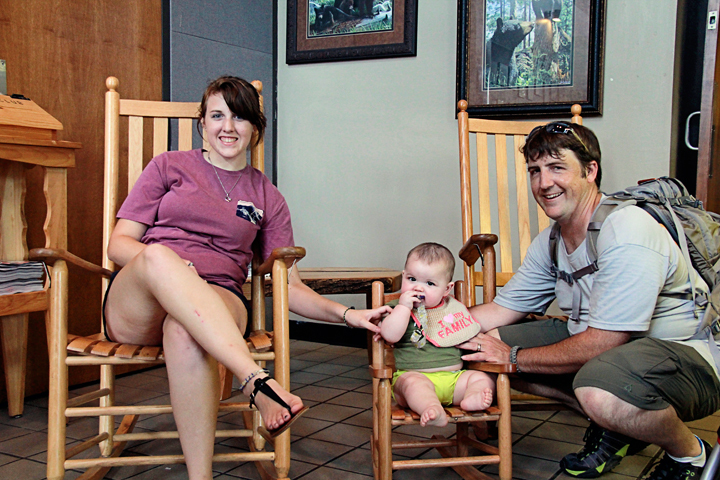 We also stopped to get a couple photos of Bug with the bears and in a small rocking chair. We also decided we had spent enough money on Grandfather Mountain and that the restaurant in the museum was way to busy for us, so we headed out and began the long trip home. 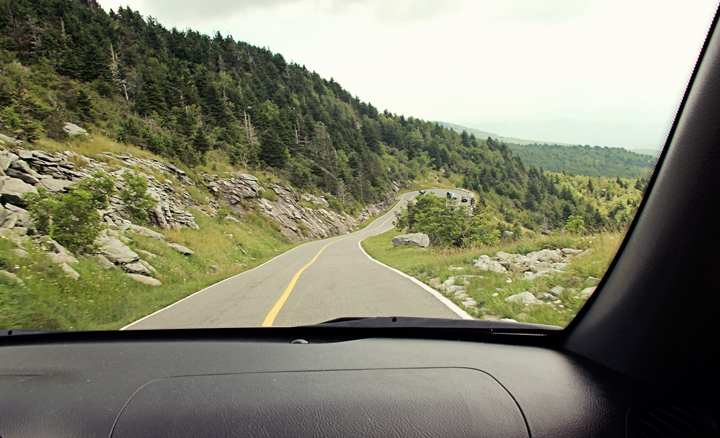 After leaving Grandfather Mountain, we got back on the Blue Ridge Parkway almost immediately. We had to back track just a little bit because at the point we had by-passed the Linn Cove Viaduct. It's not everyday one gets to drive across the most complicated bridge ever built. Once across, we turned around and continued our journey South eventually heading for home. There weren't many more stops along the way. We had every intention of stopping at Linnville Falls, however by the time we got to the turn, everyone was passed out 'ceptin me and there was road construction going on in front of the road to the visitor center. We stopped in Little Switzerland and also drove all around it as this was a spot Robin had been to as a child. After driving around for a good thirty minutes or more, she decided that Little Switzerland was not the place she was thinking of, however she had still be here. We also stopped at the Crabtree Falls visitor center. They had a shop, the promise of coffee, and free WiFi (we did have some social media things to post from Grandfather Mountain after all). Most importantly, the had bathrooms and as it turned out the coffee was just a couple of crappachino machines so after answering our calls, we loaded back up and continued or trek. We finally made it to the entrance to Mt. Mitchell State Park. By this time, our inner diva's were starting to take control and rather than make it all the way to the cloud covered top of the mountain, we were prompted by our bellies and our general grouchiness from lack of food to stop at the Mt. Mitchell restaurant for food. It was quite clear to us that the hunger had gotten the best of us and Dinah was well beyond over the fact that she had been couped up and stuck in her car seat for far too long. Fortunately it wasn't long before we all had Mt. 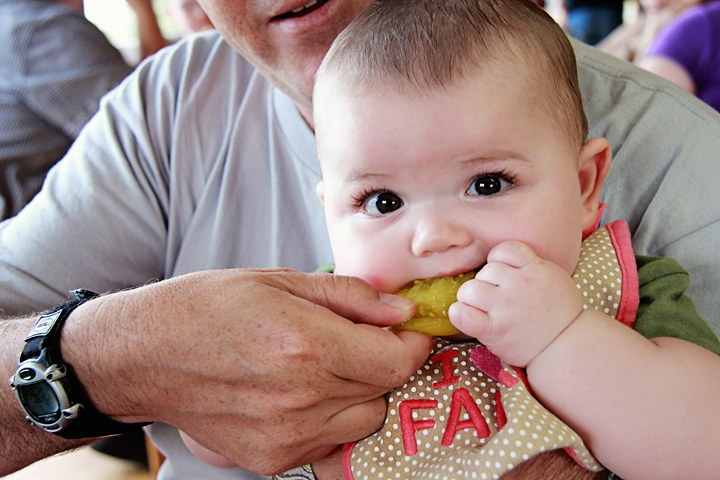 Mitchell club sandwiches in front of us and some sweet pickles for Bug to enjoy, who'da thunk it? After our meals were complete and our attitudes back in check, it was time to head for home. We loaded back into the SUV again and headed back to the parkway. 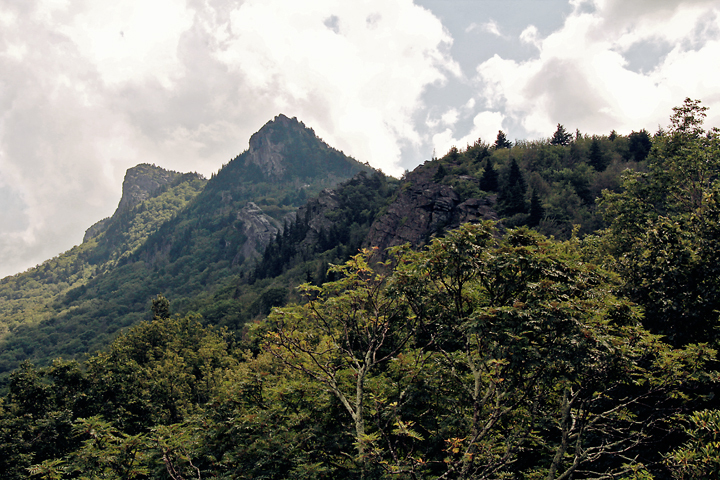 It wasn't long before we were passing through Craggy Gardens. This place is absolutely beautiful and a must for us to go back and explore. We didn't stick around here or get out, we just drove through slowly and continued our trek towards the homestead. Before we knew it, we were passing the Folk Art Center and then our exit off the Blue Ridge Parkway. We stopped at the visitor center for a minute to figure out where exactly we were supposed to get off at and head towards Asheville. It didn't take long and we were back on our way. Once in Asheville, we saw the first sign for a Starbucks and I decided we needed more coffee to complete our drive back to Knoxville. Within four hours we were back at the homestead, tired and exhausted from our trip but our childish lust for adventure and wanderlust had satiated once again, at least for a little while. It was indeed a wonderful trip, one that won't be soon forgotten and one that would make us long to go again and explore various areas of the Parkway more in depth.